Last month, the website alleged that Budapest’s Central European University (CEU), founded by Hungarian-born billionaire George Soros, was engaged in “concrete fraud” by issuing fake degrees. Hours later the EU country’s government published a bill proposing tighter rules for foreign-registered universities, with the CEU, set up in 1991 after the fall of communism, seen as the main target. The internationally respected CEU, long eyed with suspicion by Orbán as a hotbed of liberalism financed by his bête noire Soros, has warned it may have to close as a result. 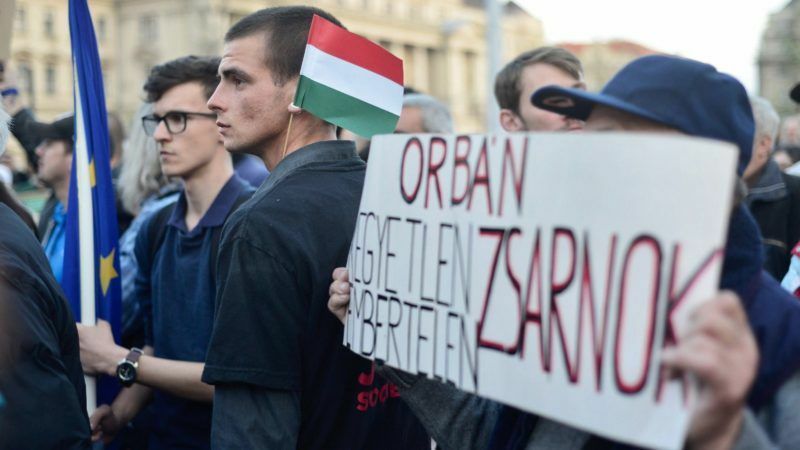 But despite an international outcry and the CEU threatening to sue over Origo’s “outrageous falsehoods”, parliament, dominated by Orbán’s Fidesz party, rubber stamped the legislation on Tuesday. #Hungary: #FakeNews is put into play through a point of release: #Origo, once an independent news organization. Merits watching & mapping. Origo’s transformation began in 2014 when the then-editor was sacked soon after the site published an expose alleging extravagant travel expenses by a government minister. That prompted a mass walkout by staff who suspected political interference. The site’s German owner Deutsche Telekom quickly offloaded the site to a media firm linked to Fidesz. Origo’s content openly lurched toward government agendas only with the arrival of a new editorial team in 2016. Since then its front page has been dominated by hit pieces on Orbán’s favourite targets: opposition parties, migrants and the Hungarian-born Soros. “The site was turned into a lie factory of fake news,” former Origo sports journalist Bence Martha, who was fired last month, told AFP. Martha said he and colleagues were cautioned about “negative” reporting and that articles were rewritten by editors without journalists’ consent. Pieces even “remotely critical” about state funding of sports or other politically sensitive subjects were “asking for trouble,” he said. 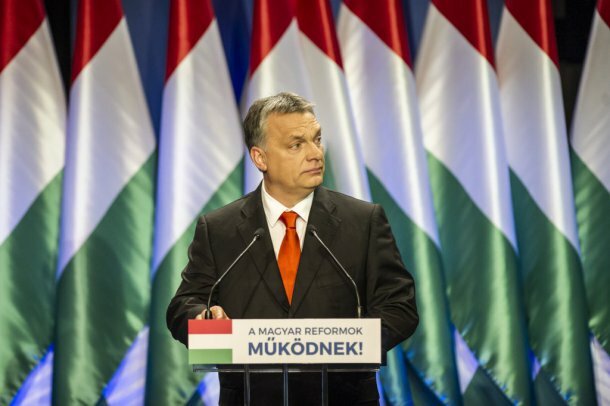 After sweeping to power in 2010, Orbán, an admirer of “illiberal democracy”, set about radically overhauling the media landscape – as well as a raft of state institutions. The European Commission took a cautious stance Wednesday (22 December) over a controversial "media constitution" in Hungary that has been heavily criticised for restricting press freedom in the country taking up the EU's rotating six-month presidency. EURACTIV.hu contributed reporting from Budapest. Public television and radio channels were merged and given the same content from the state news agency. Monitors including the OSCE have since criticised public news channels for coverage overwhelmingly biased toward the government before 2014 elections and in a 2016 referendum on migrants. At the same time business interests close to the government, like Hungarian-born Hollywood producer Andy Vajna who bought the television channel TV2, have snapped up commercial outlets. An unlikely new magnate is Lorinc Meszaros, a former gas fitter who is now mayor of Orbán’s hometown Felcsut. Now one of Hungary’s richest men, Meszaros recently picked up a large share of the Mediaworks publisher that owns most of the regional newspapers, as well as top sports and business dailies. One of its titles, Nepszabadsag, used to be the main opposition newspaper until the portfolio’s previous owner, an Austrian investor, abruptly suspended production in October citing commercial reasons. 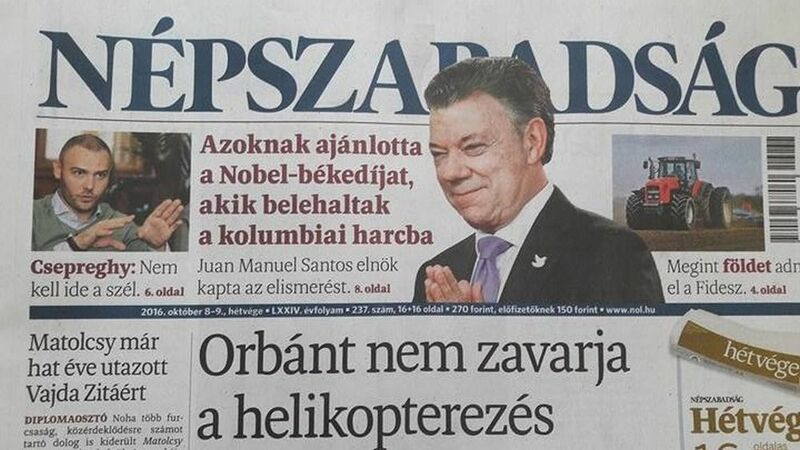 Hungary’s largest broadsheet newspaper Népszabadság has stopped publication, with journalists and the opposition alleging government pressure. 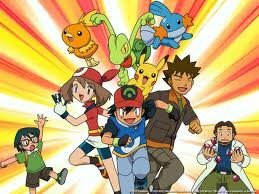 In December Mediaworks said the paper would not be reopened. Meanwhile a formerly independent business weekly Figyelo, bought in December by another Orbán ally, Maria Schmidt, recently deleted its archive and featured a double-spread government anti-EU campaign advert “Let’s Stop Brussels”. “A clear coordination has emerged between government propaganda and the media army controlled by Fidesz, including Origo and all the other platforms,” Gabor Polyak, an analyst with the Mertek media watchdog, told AFP. Without advertising from state bodies and companies, media still not aligned with the government struggle to break even. An opposition daily Nepszava also printed the “Let’s Stop Brussels” advert but with a disclaimer: “Independent journalism continues unaffected by the propaganda campaign”. Orbán has tried to “shrink the space” for critical voices, said Andras Petho, the journalist who broke the ministerial expenses story in Origo three years ago. “I wouldn’t be surprised if they decided to go after the few remaining independent outlets before the next elections (in 2018),” he told AFP. One media tycoon will be hard to shake off though; Lajos Simicska, a college friend of Orbán’s and financier of Fidesz who in 2015 spectacularly fell out with the prime minister. Simicska’s billboards recently carried opposition party Jobbik posters branding Meszaros and Orbán thieves while his newspaper and TV channel, formerly pro-government, have turned hostile. Neither the government nor Origo responded to AFP requests for comment for this article.